Gerry Gwaltney is not an easy man to slow down. Whether bow hunting or fishing, he has always preferred to be on the move. It took both multiple sclerosis and a very rare spinal condition to get him off his feet. But even those ailments were no match for a man with so much determination and the help of his local OSF Rehabilitation team. Gerry had been living with MS for more than a decade, and the disease limited the mobility of his left leg. It was something he could deal with, though, and it didn’t prevent him from getting around. Seemingly overnight in the fall of 2017, however, he began to lose function in both legs. It got so bad he had to rely on a wheelchair. In January 2018, Gerry was diagnosed by a specialist at OSF HealthCare Illinois Neurological Institute with an arteriovenous fistula that entangled the nerves in his lower spine. Blood vessels were interfering with the passing signals through the nerves. It was robbing him entirely of his mobility below the waist and required immediate surgery. Gerry underwent surgery at OSF HealthCare Saint Francis Medical Center in Peoria, where spine surgeon Jeffrey Klopfenstein, MD, repaired the fistula. He was bedridden for two weeks, then he underwent two weeks of inpatient rehab. The fistula and the subsequent surgery left Gerry with no strength to stand. He needed equipment to help him get out of bed. But life in a wheelchair was not in Gerry’s long-term plan, so he dove in to rehabilitation, committing fully to the process. Still unable to walk, Gerry returned to the comfort of his home about a month after surgery. 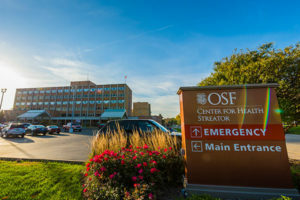 OSF HealthCare Center for Health – Streator provided the continuity of care, the treatment facilities and the rehabilitation specialists Gerry needed to face the challenge. The rehab journey would be difficult, but at least he didn’t have to make a long commute to access the care he needed. Starting in March, he went to rehab three times a week at the Center for Health. As he progressed, he cut down to two sessions per week. The therapists assigned him regular exercises to do at home. His wife helped make sure he stayed on track and followed through. One of the trainers went with him to the Streator Family YMCA and showed him how to practice walking in the pool. 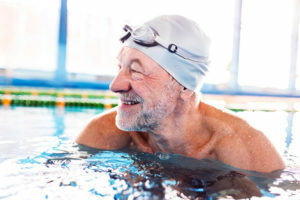 That helped him build strength to walk outside the pool with the help of a walker or cane. Gerry’s progress demonstrates how well an expert-guided rehab program can impact a person’s quality of life. He uses a walker for balance but has the strength to rise and walk. He hasn’t recovered the mobility needed to get back to hunting, but he can at least go out to his backyard and shoot targets with his bow. He no longer needs the mechanical lift to get in and out of the pool. He can steady himself with the hand rails. Gerry gives a lot of the credit for his recovery to the OSF Rehabilitation team, who pushed him and guided him the whole way, and to his wife, who kept him honest. But Kelly Anderson, a physical therapist at OSF Center for Health – Streator, says Gerry made his own recovery possible. Gerry was in pretty rough shape when he first showed up, she said. It was difficult work transferring him from the wheelchair to the training table. It was so bad, she was a little skeptical at first about how much mobility he would be able to recover. But Gerry and Carol never let up. Gerry continues to work out at the local YMCA, trying to recover as much of his mobility as he can and beating back the effects of MS. He remains grateful to the OSF HealthCare providers who diagnosed and treated him, especially his hometown rehabilitation team, which helped him establish the habits he needed to get back on his feet, literally. Visit the OSF Rehabilitation page to learn what quality rehab can do for you and find the nearest location.